From the back cover: Many years ago, Franklyn MacCormack grained great popularity with his spoken interpretations of poems and love songs of the day to musical backgrounds. He was one of the best known personalities of his day. 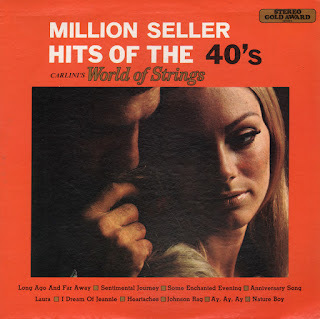 These songs, "from the heart", performed with dignity and sincerity in the inimitable "fresh" Steele manner, could easily establish Ted as the spokesman for all lovers and losers of our generation. 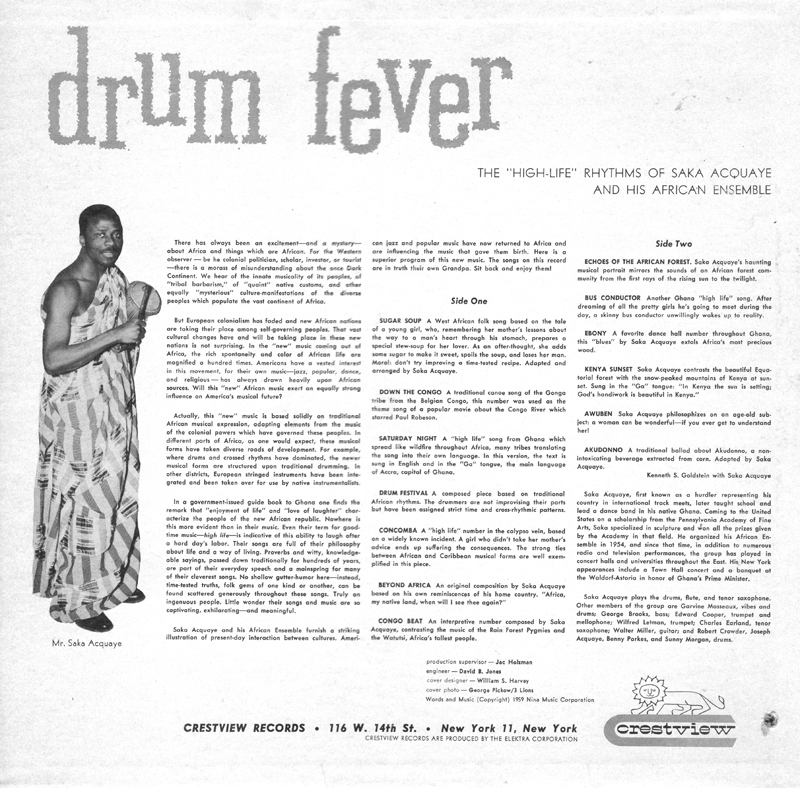 This somewhat obscure press is released digitally as "Ghana High-Life" without artist credit so I will not be posting a sample. This press seems to have been released for the first time by Crestview in 1963 (receiving a mention in the May issue of Billboard). There is a 1959 copyright coving the "words and music" printed on the back cover. So, the music seems to have been created during same year that Martin Denny released Hypnotique, Afro-Desia, Exotica Volume III and Quiet Village and perhaps then recorded and or released sometime later (1963?). 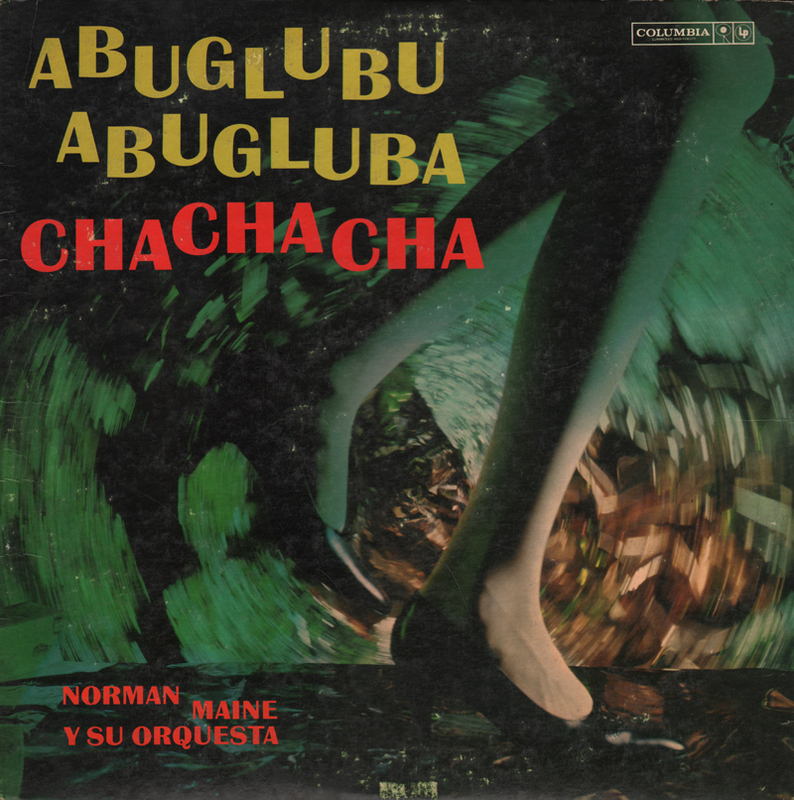 The sample track above reflects the "exotica" musical trend of the late 50s by the inclusion of "natural" sound effects. 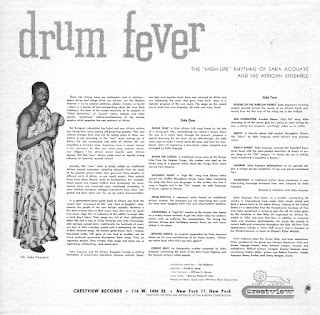 The rest of the album is handled more like a "traditional" African folk even thought the set is infused with period mood/jazz flourishes added by instruments, such as the vibes. 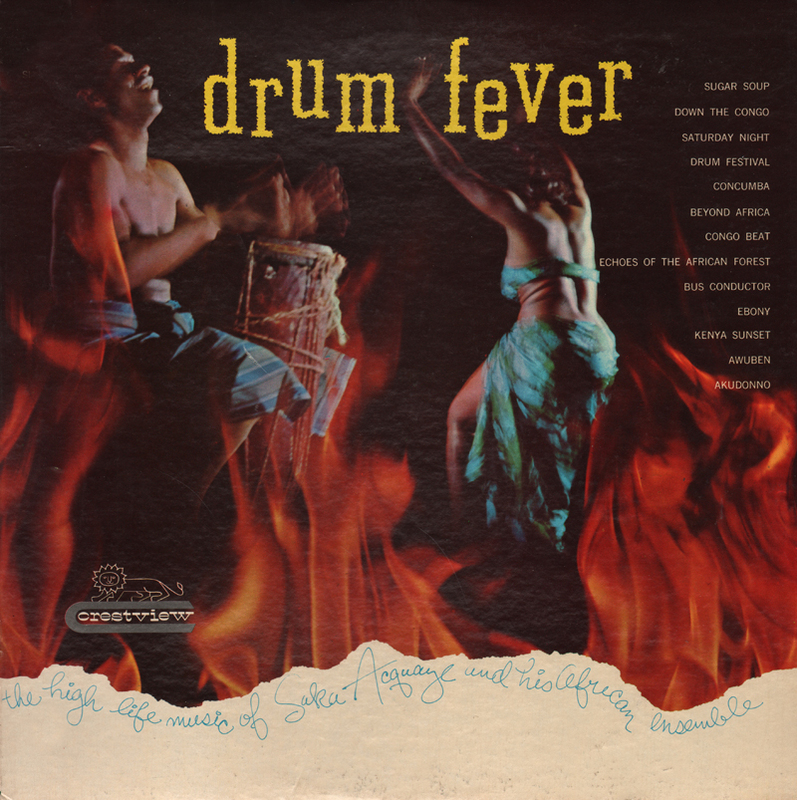 The entire set is arranged to keep you engaged by mixing up tempos and approaches to the percussion sound. Saka Acquaye plays the drums, flute, and tenor saxophone. 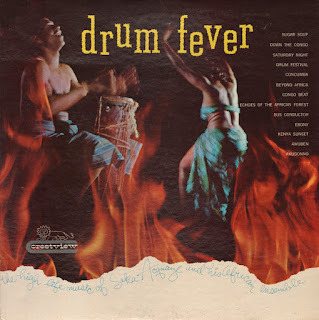 Other members of the group are Garvine Masseaux, vibes and drums; George Brooks, bass; Edward Cooper, trumpet and mellophone; Wilfred Letman, trumpet' Charles Earland, tenor saxophone; Walter Miller, guitar; and Robert Crowder, Joseph Acquaye, Benny Parkes and Sunny Morgan, drums. Peppy tunes arranged with enough variation to the beat to keep you engaged as the set plays through. Above, the sample, is the only track on the album that features an uncredited solo vocal, which I assume, could be Houston himself. From the back cover: Out of the West Coast rode Joe Houston, WILD MAN OF THE TENOR SAX, on a rock and roll beat that's sent the nation's teen-agers into a stomping' stomping', frenzied panic. In the short span of two years, Houston has catapulted from the ranks of the unknown into a top box-office attraction, and one of the nations most talked-about musicians of the day. 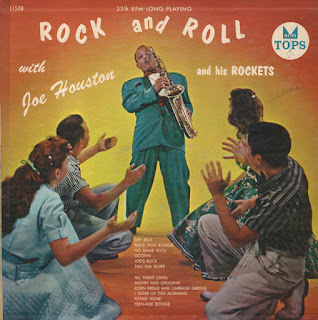 When Joe gets into a solid groove, his tenor sax plays a powerhouse music that literally blow away inhibitions, producing an emotional condition among his rabid listeners that can be mildly described as mass hysteria. Shouting, stomping, whistling, and screaming jazz concert and jazz crowds are whipped into unbelievable excitement by the raw, primitive, rhythmic patterns. From the back cover: Cook happens to be one of an almost deceased profession. He's a piano-roll-perforator-arranger-musician! 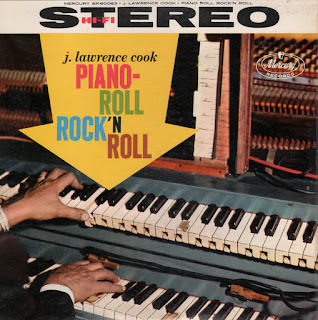 J. Lawrence Cook came to New York from Pittsburgh in 1920, after completing a college preparatory course in piano technique. He's been fascinated by the player piano from childhood, recalling sitting through three or four runs of a silent flicker just to hear the player-piano background. In the spring of 1921, he purchased a simple, hand-operated music roll perforator and studied the work of contemporary piano roll artists. He also took courses in harmony and composition. 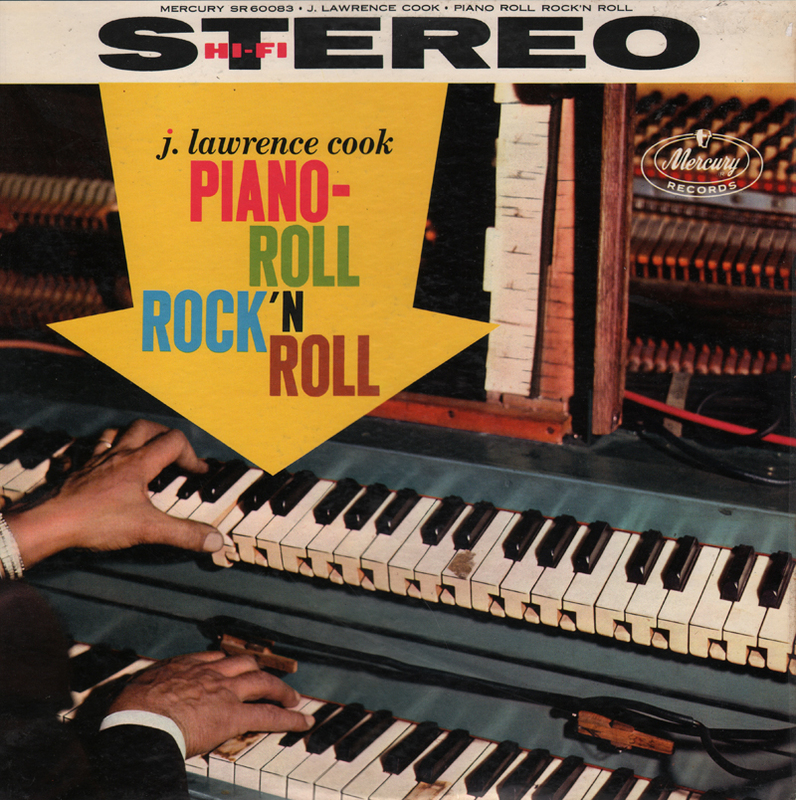 His first piano roll were made for U.S. Music Rolls in 1921 and continued thru 1923, when he joined the staff of Q.R.S., with whom he is still associated today. 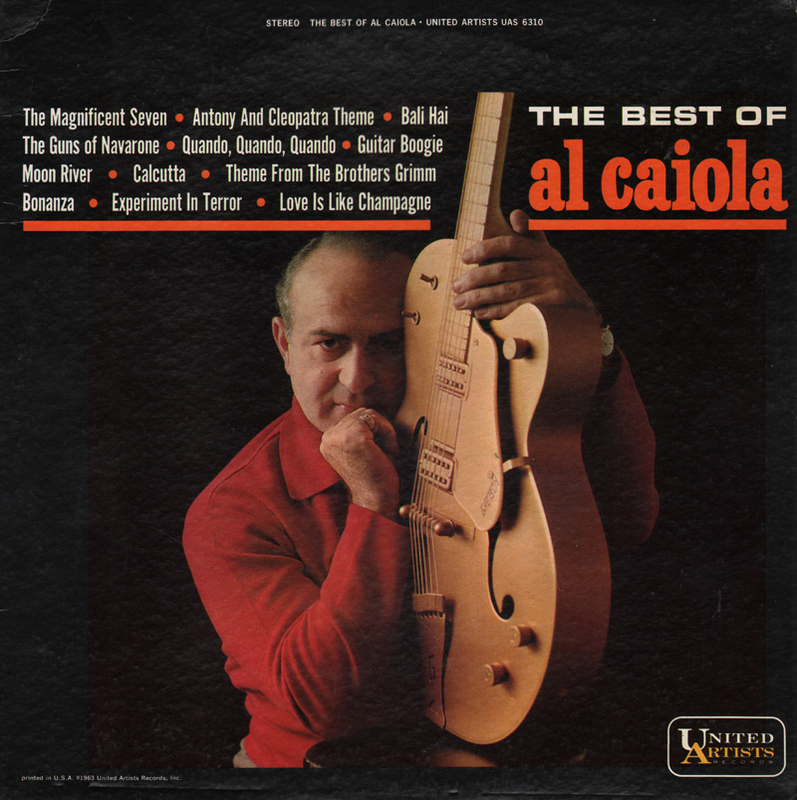 Swinging big band space age Latin. The copy I found is a Columbia "demonstration" issue. 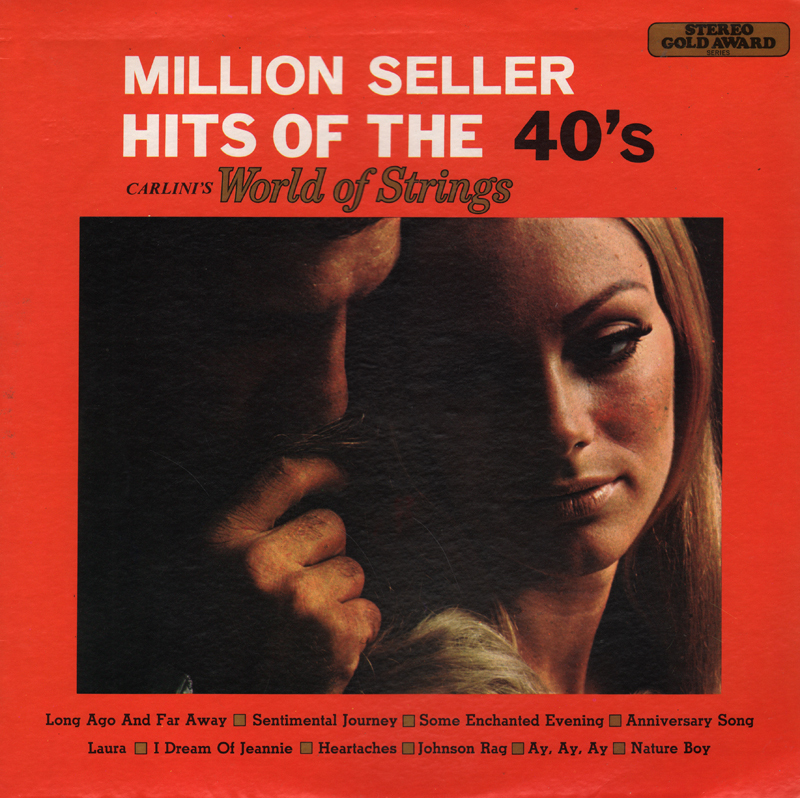 Manufactured By Haddon Record Corp.
Well executed budget lush strings set.